A version of this story, titled “Facing up to the past”, was first published in Mint on Sat, Apr 26 2014. 12 11 AM IST. 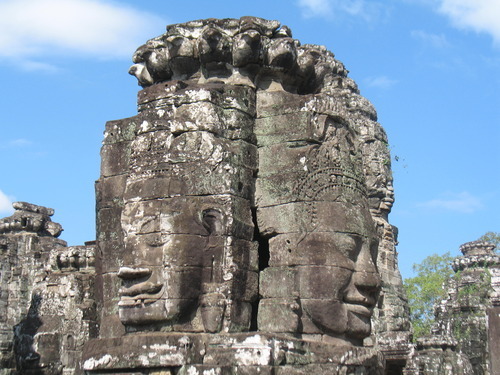 The 216 faces of the Bayon seem to know something we don’t. J7 is what he’s called by the locals. No, he’s not a rapper, but he certainly is a hero in this part of the world. 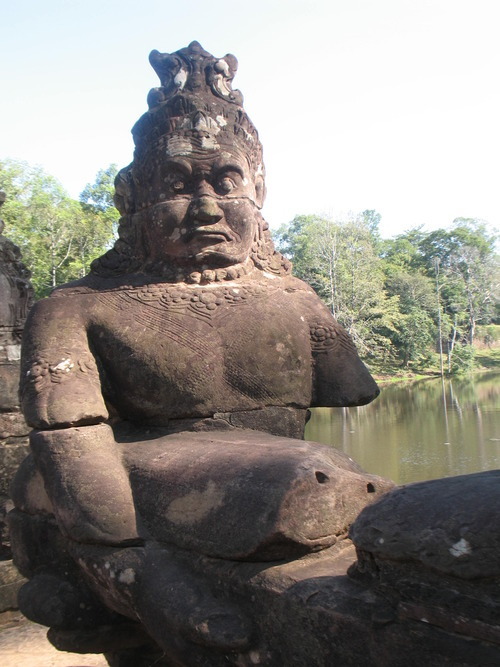 J7 or King Jayavarman VII was a ruler of the Khmer empire (present day Cambodia) for 37 years (1181-1218). He is credited to have built, apart from numerous temples, bridges and hospitals, the city of Angkor Thom, north of Siem Reap. I am at the South Gate of Angkor Thom with my family and a local tour guide, Sophai Cham. We are visiting the Bayon temple of postcard fame, which sits in the centre of the city. The gate is a 23-m tall structure built into the 8-m high wall that runs around the city. The wall is surrounded by one of the most beautiful moats I’ve seen— the water in it is clear, emerald and dotted with pink lilies. A stone causeway leads up to the gate. It is flanked by a row of statues on either side which hold the body of a seven-headed naga (serpent) to represent the Hindu mythological event, the churning of the sea of milk. “To the left are the devas, the good man, and to the right are the asuras, the bad man,” says Sophai. The devas look serene and the asuras disgruntled. Many of the statues lack heads and limbs, which were broken and sold illegally across the Cambodian border. I wonder how someone could sneak away unnoticed, with one of these enormous faces tucked under an arm. The gate is adorned with four large faces, each looking outwards in a different direction. Each of them has thick lips curving upwards at the corners in a meditative smile. “The faces represent Lokeswara or Avalokiteshwara, the Bodhisattva of compassion,” Sophai says. On either side of the gate are three-headed elephants with three trunks, which depict Airavata, Lord Indra’s vehicle. With Hinduism and Buddhism both represented within one structure, the gate serves as my first introduction to this unique two-in-one religious theme that seems to pervade Cambodia’s temples. From afar, the temple appears to be an indistinct pyramidal pile of sandstone. As we draw closer, the details emerge. In front of it is a pond, around which photographers crowd in yogic postures in attempts to find the perfect angle at which the temple and its reflection fit into the frame. A giant tower rises in the centre of the temple and is surrounded by towers of decreasing height. Sophai tells us that the structure is supposed to represent Mount Meru, home of the gods in Hindu mythology. The water around it signifies the cosmic ocean. The Bayon was built by J7 originally as a Mahayana Buddhist shrine towards the end of the 12th century. The faces are thought to not only depict Avalokiteshwara, but J7 himself! When King Jayavarman VIII (“J8”, of course), a staunch Hindu and J7’s successor, came into power, he destroyed Buddhist symbols and replaced them with Hindu ones. Sophai tells us that the locals believe that J7 and J8 were brothers. 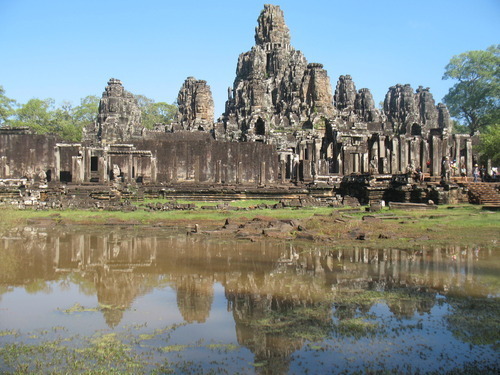 “When J8 looked at the Bayon temple, he was confused! The faces looked so much like his brother’s that he could not bring himself to destroy them.” And so the Bayon survived. When the French started restoring the temple in the early 20th century, they thought the faces symbolized the Hindu god Brahma. However, a Sanskrit inscription on a piece of rock established the temple’s true identity. I walk up a couple of stairs to the outer enclosure, a labyrinth-like bunch of pillars and walls. 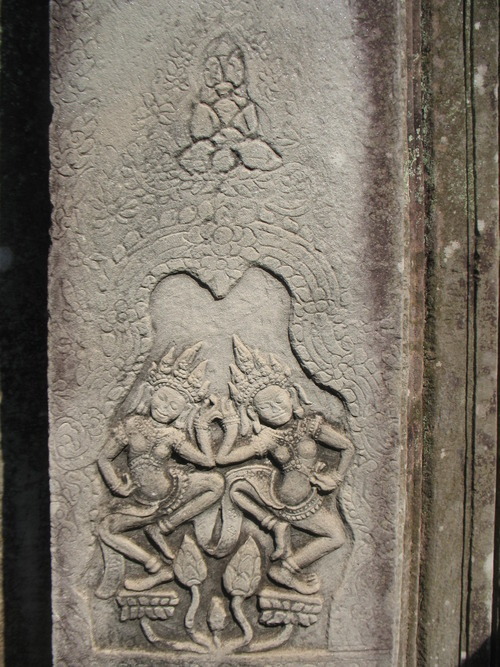 On many of the pillars are the motifs of dancing apsaras. “Apsara is the name of our traditional dance,” Sophai says. “I was an Apsara dancer for many years. But I had to discontinue because I could not bend my body enough.” I watch in fascination as he proceeds to bend his fingers backwards so that they almost touch his wrist. 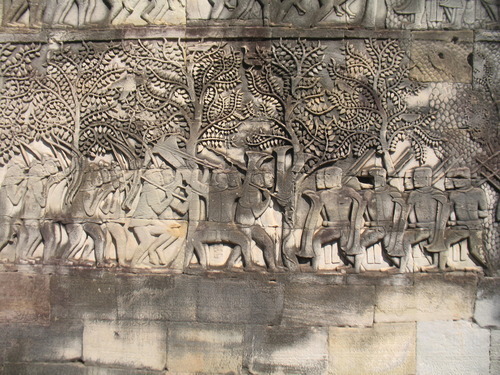 The outer gallery has intricate bas-reliefs of battles between the Khmer and the Chams and depict everyday activities of the Khmer people such as farming, fishing and cooking. Some elements are carved in painstaking detail – branches of trees gracefully make their way through thousands of delicate ovate leaves. The gallery opens into a courtyard, which is flanked by two libraries. They can be accessed by a row of very narrow steps. It is only possible to walk up while placing your feet sideways on the hard uneven surface. “To reach God you have to do a little hard work!” Sophai grinned at us. He tells us the steps are made in this way so that one may descend the library without “showing your back to God”, which is considered disrespectful. Earlier, the courtyard was divided into chambers which housed symbols of various religions – Buddhism, Hinduism, animism and personal cult. Though J7 was a devout Buddhist, he was tolerant towards other religions as well. From the centre of the temple rise over 35 gigantic towers (there were 49 originally). Most of the towers bear four faces that are arranged back-to-back such that they look outwards. Each face has closed eyes and a (almost maddeningly) mysterious smile. For some time, I can only gape. 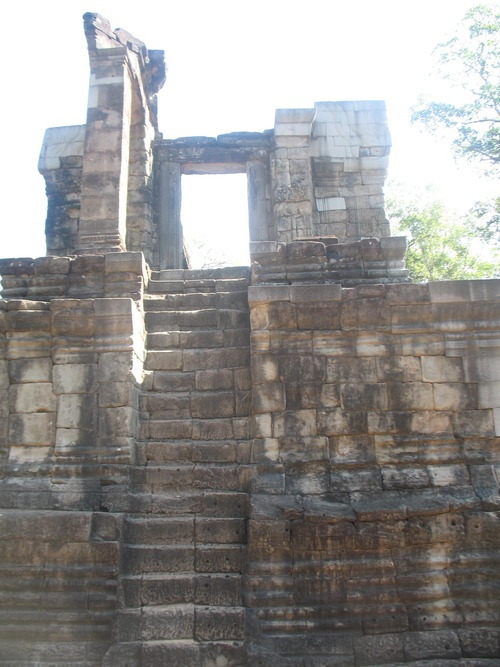 Nagas form a protective crown above each tower. The faces are formed by interlocked pieces of stone – half a lip is on one piece of stone and the other half on another, giving it a jigsaw-puzzle like appearance. “One stone out of place and whole statue crumbles,” Sophai informs us casually. I immediately have a vision of the faces crashing down in Jenga fashion. Moss has grown on some of them, adding a touch of green to the salt-and-pepper, and some of the ears sprout leaves. Irrespective of the truth behind J7 and J8 being brothers, I see why it would’ve been so hard to tear down something like this. If J7’s intention while carving the faces of the Bayon in likeness to his own was to perceive himself as a “devaraja” or god-king, he certainly achieved it because even I can’t escape feeling a sort of overwhelming reverence as I stand there. I park myself on a bench, captivated by the aura of the place, determined to strike a conversation with these 200-odd smiling faces. I feel like if I stay and stare long enough, I could will one of them to open its eyes and speak to me.